SPINEXPO Shanghai that was held at the Shanghai World Expo Exhibition & Convention Center of Pudong, Shanghai, from 2-4 September welcomed various international visitors, asserting its international leadership in the field of fibres, yarns, knitwear and knitted fabrics, organisers report. With a stable and consolidated visitor attendance and a strong increase in business activity, the 24th session of the show hosted 225 exhibitors from 15 countries and welcomed 11,052 visitors, and 14,211 re-entries. 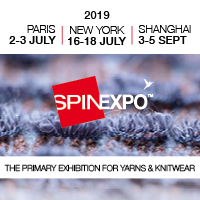 The increased number of knitwear companies forming the Knitwear Pavilion makes SPINEXPO an international offer for all visitors looking for a global solution in the knitwear industry, organisers believe. Globalisation leading the world’s industries was the theme for this 24th session, where the Main Trend Area, directed by Sophie Steller and titled Sensing the Motion, showcased a larger than ever number of partner companies exhibiting at the show and helped revitalise various concepts of fashion. Other Trend Areas included a brand new innovative display Denim Couture that continues with the concept of sensing by looking beyond knitwear, exploring a multitude of creative and expressive techniques that combine to make a rich display that looks at denim in a whole new light. Designers’ creations look at how trimmings, embellishments, mixed media of fabrics, foiling and printing can all impact and transform denim and therefore our perceptions of how we can apply this to all aspects of fashion. The graduates’ work from Nottingham Trent University was on view within the What’s In area. The garments and fabrics exhibited were created by students working in collaboration to develop designs of fabrics and garments for the emerging trends and concepts using yarns from a variety of spinners. What’s In also showcased a range of garments that have been developed through student sponsorship and live projects with spinners throughout the year. These sponsorships have evolved after many years of the successful collaborations with SPINEXPO. The University also had its own area where more work from the students could be seen. A number of events took place during the 24th session, starting with a presentation of Mohair South Africa that launched its branding at the show. South Africa is driving global mohair production to new heights, backed up by a growing interest in fashion for the fibre. South Africa is home to the largest mohair handling and marketing facility in the world with over 50% of all mohair produced originating from the angora goat farms on the beautiful plains of the Karoo in South Africa. The branding attests that mohair produced in South Africa has acclaimed recognition for its superior qualities and has become the preferred supplier of mohair internationally. Known as the Diamond Fibre, mohair is in high demand due to the change in consumer trends. Woolmark Company celebrated 50 years of the Woolmark Brand and the logo’s purpose of acting as an independent quality assurance of every product it adorns. The company has gained its reputation as being the global authority for quality woollen products, developing close relations with the fashion world and its rich tradition of nurturing fresh talent within the industry. The company presented its new seasonal guide to the best wool trends and products at SPINEXPO.